You provide the kids. Denver Divers provides the bubbles! 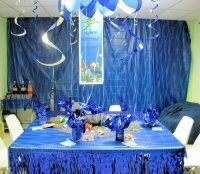 For kids age eight and up, we can give your birthday boy or girl a pretty unique birthday party. We’ll put the party-goers in pint-size scuba gear and take them “down under” in our indoor saltwater pool. A few short words in Sea Sign language will let the kids “sing” Happy Birthday underwater! Kids can also play games underwater, closely supervised by our Dive Professionals. The basic cost is $50 per child and includes dive equipment, close supervision, and fun! A $100 deposit will hold your time and date. Parents of every party participant must complete and sign paperwork, which includes some medical questions. If the answer to any of the questions is “yes,” the child’s doctor must verify the child is able to participate in the activity. Parents must also watch a video describing the risks of scuba diving. These are all requirements for adult divers as well. Either drop by or call for more information including a look at the equipment and a tour of the pool. 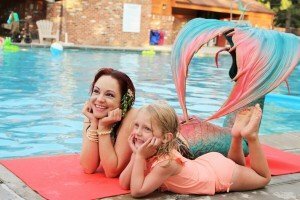 Check out our Swim with a Mermaid Birthday Parties with Wands and Wishes Occassions! Are your kids ready to learn more about scuba? Check out our dedicated children's program, Scuba Rangers! 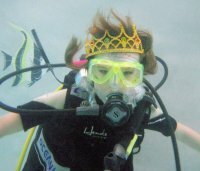 Kids age 10-14 can become certified as a Junior Open Water Diver, and once they turn 15, with a short Update class, your budding scuba enthusiast will now be a full Open Water Diver! And both Scuba Rangers graduates and Junior Open Water graduates can join us for our "Specialty Rangers" activities. Activities include Ranger ROV, Navigation, Night Fluorescent dives, and much more!